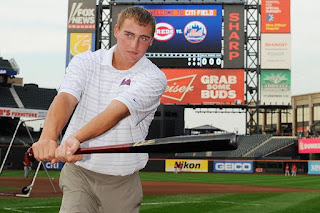 Brandon Nimmo was born March 27th, 1993 in Cheyenne Wyoming. The six foot three left hand hitting outfielder, was the first draft pick of Sandy Alderson's as General Manager of the New York Mets. He is also the highest player ever drafted out of the state of Wyoming, as the Mets number one pick (13th overall) in 2011. He was certainly a gamble since his high school didn't even have a baseball team. He spent 2011 with the Gulf Coast Mets & Kingsport Mets. In 2012 he was playing with the Brooklyn Cyclones leading the team with 40 RBIs & second to Kevin Plawecki with 6 HRs, while hitting .248. That year he had a big six RBI game topped off by his second grand slam of the year. He was the only player in the NY Penn. League to hit two grand slams that season. Nimmo was known more of an RBI man with power as opposed to a hitter who hits for average. 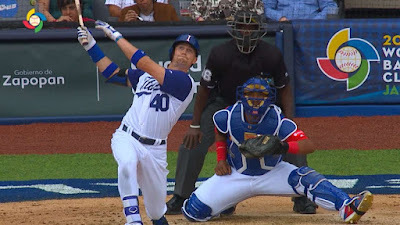 He spent 2013 batting .279 at A ball Savannah, where struck out 131 times in 395 at bats, he was selected to that years All Star Futures Game held at Citi Field. He started out 2014 with the St. Lucie Mets batting a career best .322 in 62 games. He then moved up to AA Binghamton where he hit 6 HRs with 26 RBIs in 65 games. After a short four games at St. Lucie in 2015 he was back at AA Binghamton where he suffered a knee injury that caused him to miss some time. In 68 games he hit well at .279 with 2 HRs & 16 RBIs. 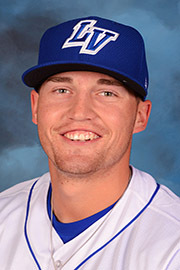 He was soon promoted to the AAA Las Vegas 51s where he was named the teams starting center fielder. Another injury where he fouled a ball off his nose slowed up his progress, in 32 games he hit 3 HRs with 3 doubles 8 RBIs while batting .264. The Mets added him to their club after the season, protecting him from the Rule V draft. In January he tore a tendon & had to wear a protective boot which came off in late February. Quotes: Brandon Nimmo " It wasn't one specific movement, I went, worked out, did the conditioning movements, weightlifting and even hit. Went and ate lunch, was fine. Went and sat on the couch for an hour, and got up and felt like my foot had been broken. It just came on very acutely. Tried to let it rest for a week but then it was still bothering me." "I definitely came into this season wanting to try to help make an impact for this team, especially watching it all unfold from home this past offseason for me, but during the playoffs for them. It looked like something special. It's a special group of guys that we have now and something that I definitely want to be a part of. I just want to help the team do the best that they can and hopefully win a World Series." Nimmo started the 2016 season at AAA Las Vegas, in 63 games he batted .328 with 16 doubles 7 triples 5 HRs with 26 RBIs & a .409 on base % in 63 games. On June 25th he was called up to the major leagues as the Mets sent Michael Conforto down to AAA Las Vegas in order to work out things out. When Las Vegas manager Wally Backman called Nimmo in to his office he told him he was pleased with his play & development. The bad news was there was no room for him on the team charter from Reno to Las Vegas & he would need to take a separate flight. The good natured kid said ok & started walking away when Backman told him, that that flight was going to Atlanta. Nimmo made his MLB debut on June 25th, starting in right field & batting 7th, going 0-4 in the Mets 5-2 loss at Atlanta. The next day he got his first two career hits, coming off The Nats Joe Ross in Washington, in another Mets loss. Nimmo would start off his career with a hot streak, hitting safely in eight of the next ten games he appeared in. On July 1st he hit his first career HR,coming against the Chicago Cubs, where the Citi Field fans demanded a curtain call from the youngster. It was also his first multi RBI game. His average would peak at .280 before falling off & he would drive in runs in just two more games. He was sent back down to AAA Vegas from August 5th but returned as a September call up, when Juan Lagares went down with a torn thumb. 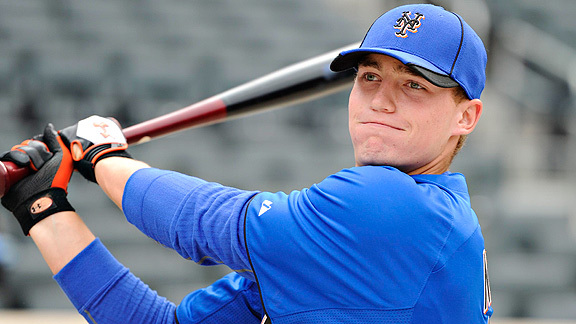 Nimmo contributed to the Mets Wild Card run going 4-9 as a pinch hitter & scoring four runs in the month. In 32 games he batted .274 with one HR, a double, 12 runs scored & six RBIs with a .338 on base %. In the off season he appeared at Citi Field for the Mets annual Christmas drive with Jose Reyes & Santa Claud; Noah Syndergaard- aka. Synder Claus. 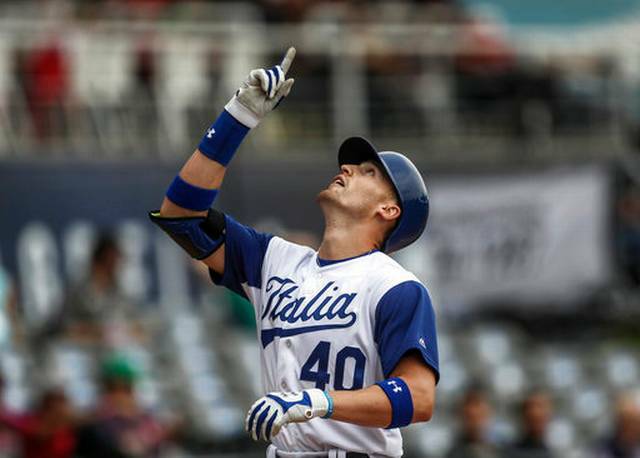 WBC: Nimmo was chosen to play centerfield for Team Italy in the 2017 World Baseball Classic. In an exciting first round win over Mexico, where the Italian team scored five runs in the bottom of the 9th inning, Nimmo drove in a run with a 9th inning base hit off former Met Oliver Perez. 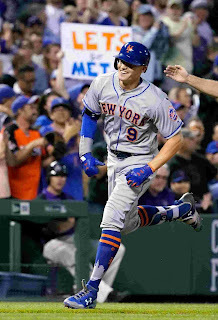 With the bases loaded, John Andreoli singled home the walk off runs, as an excited Nimmo rounded the bases. In the Saturday game against Velnzuela, Nimmo hit a HR, but then later was removed from the game where he had suffered a hamstring injury chasing down a triple in the outfield. 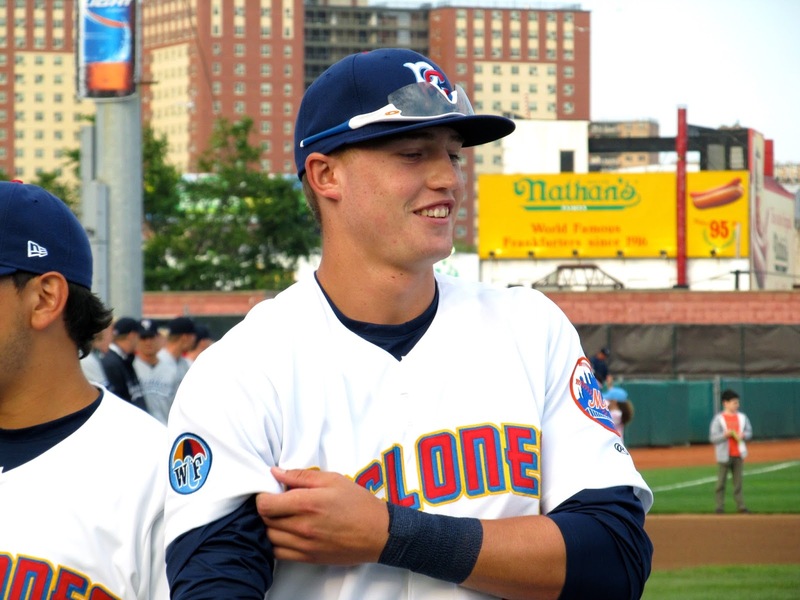 Nimmo missed the Mets 2017 Opening Day & began the season in the minor leagues. He got back to the Mets in mid June, and started out batting .350 in his first 25 plate appearances. He then suffered another injury with a partially collapsed lung, setting him back until August. At that point hitting coaches Kevin Long & Pat Roessler advised Nimmo to change his stance at the plate to not stride his foot forward. His slugging improved in September & well throughout the 2018 season. In September 2017 he hit four of his 5 HRs & drove in 14 runs, he had only driven in seven runs all season before that. He ended 2017 with 46 hits batting .260 with a .379 on base % & a .418 slugging %. He hit 5 HRs with 11 doubles a triple & 33 walks in 69 games. 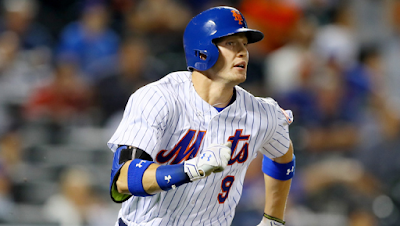 In 2018 Nimmo took advantage of Mets outfield injuries & made himself a regular in the outfield, playing in 140 games, 62 in right field -44 in center field & 32 in leftfield. His ability to get on base was his best asset, hitting, walking & getting plunked with pitches, in which he led the league in that department. On April 15th, Nimmos hit his first HR of the year. It came in the bottom of the 6th inning tying up a game against the Milwaukee Brewers. A Wilmer Flores walk off won it for the Mets in the 9th inning. A solid hitting April had him go into Mat batting .303. More importantly his on base % was at .478%. 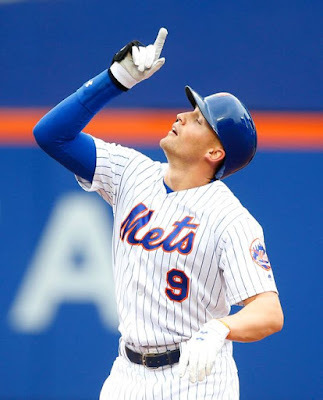 On May 19th, Nimmo doubled in the bottom of the 9th, in a tie game against the Arizona D-backs. He advanced to third & then scored on Wilmer Flores sac fly to win it walk off style. He closed out the month hitting four HRs in the final week of May. 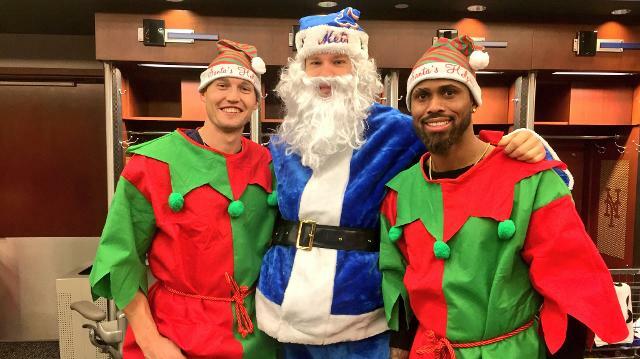 All of them came in Mets losses, except a May 28th game where they beat the Braves in Atlanta. On June 1st he collected two hits bringing in two runs in a loss to the Cubs, raising his on base % to .436%. He hit safely in all three games of the subway series at Citi Field, including a HR in the opener. 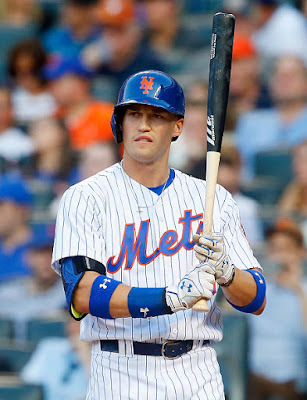 On June 17th Nimmo homered collecting three hits, helping the Mets with two RBIs in a 5-3 over Arizona. 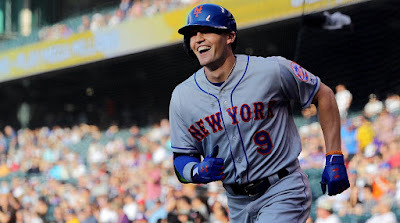 The next day in Colorado he blasted two HRs driving in four runs with four hits in a 12-2 Mets romp over the Rockies. He was now batting near .290 & holding a slugging % over .600%.He drove in runs in the next three games as well. 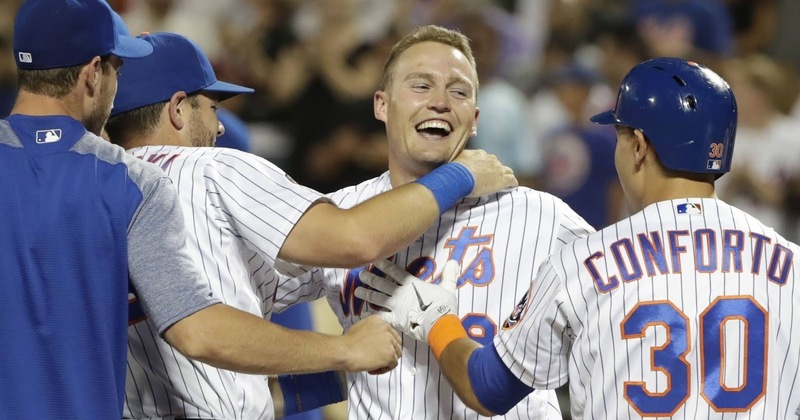 On July 11th, Nimmo hit a three run walk off HR off pitcher Mark Leiter, to break a scoreless tie against the Philadelphia Phillies. He then had two more three hit games in the month. 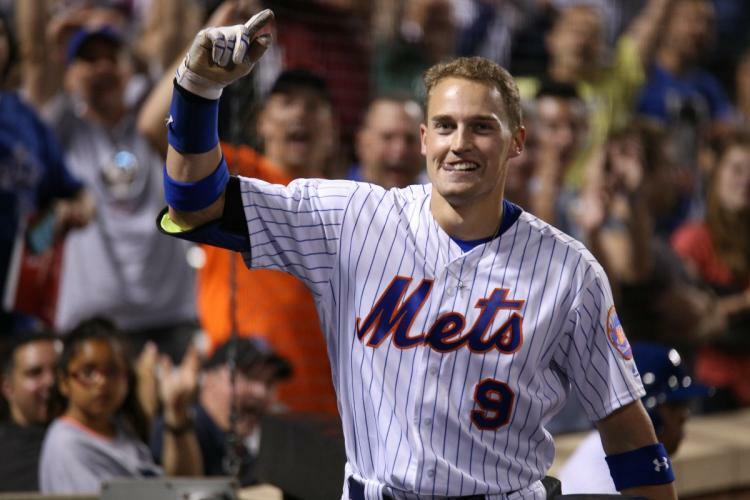 In August he hit two more HRs, another in the subway series 8-5 Mets win on August 13th. 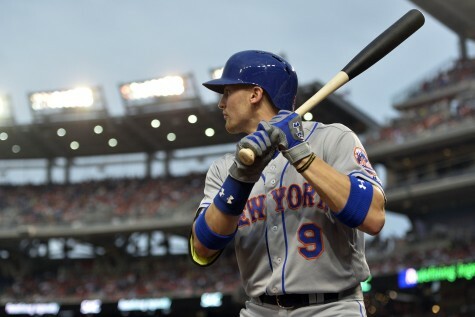 On August 15th he had a huge five hit day, driving in three runs in the Mets 16-5 win at Camden Yards in Baltimore. He missed some action in late August returning at the end of the month. 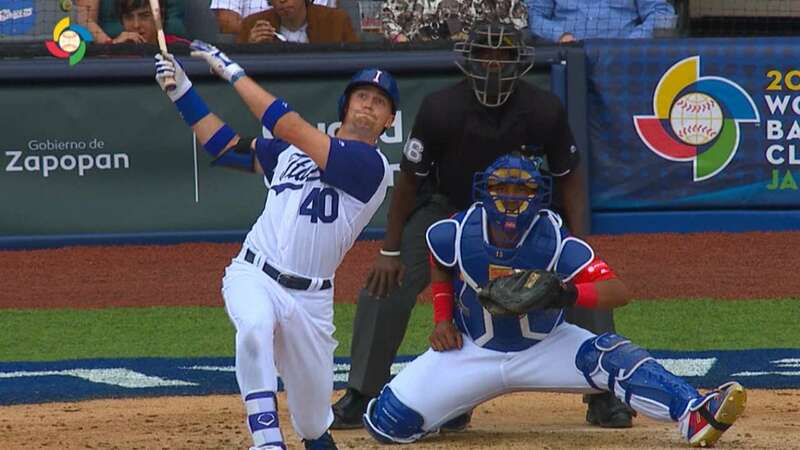 On September 3rd, his pinch hit three run HR off Kenta Maeda, broke a 1-1 tie & helped lead the Mets to a 4-2 win over the Dodgers in Los Angeles. On September 17th he hit another three run HR in Boston at Fenway Park. Nimmo closed out the 2018 season as one of the Mets best performers & promising players of the future. 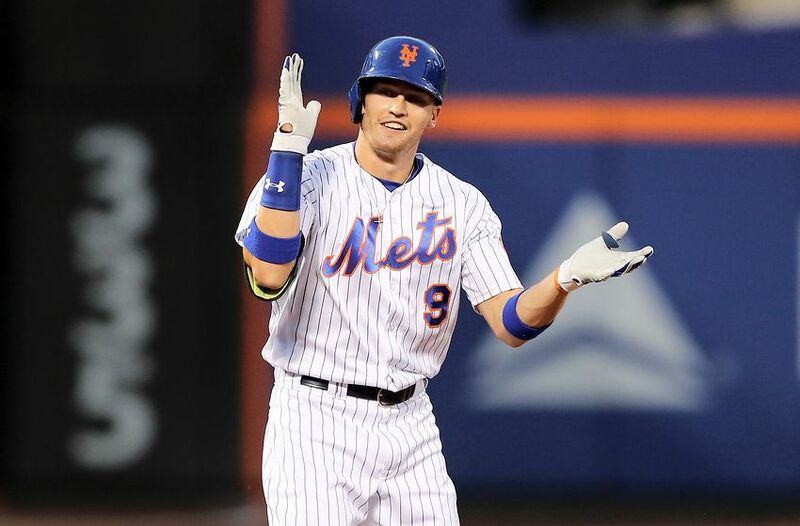 He led the NL with 22 hit by pitches & was second in the league in on base % (.404%) anything to get on base for Mr. Nimmo. He led the team in doubles (28) triples (8) tied with Amed Roasario for fourth in the NL, batted .264 with 114 hits 80 walks (9th in the NL) 17 HRs 47 RBIs 77 runs scored. He was second on the club with a .483 slugging % as well. He has pretty much locked up a starting position in the Mets 2019 outfield with a good Spring. 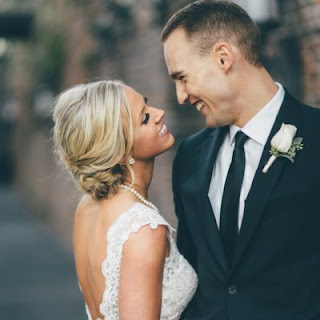 Family: Brandon married the former Chelsea Bradley in November 2017 in Savannah, Georgia.